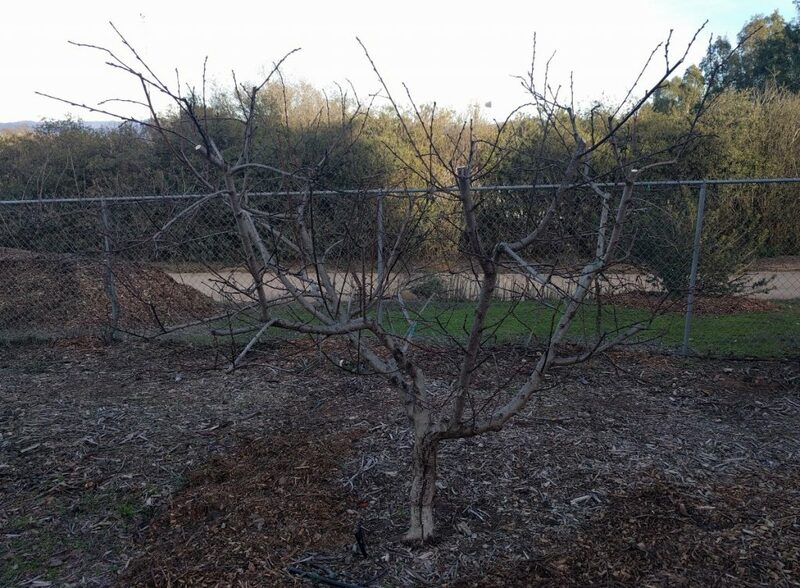 What do you think about when you’re pruning your nectarine tree? I think about sunshine. Myriad smaller thoughts also go through my mind, but my overarching thought is about imagining rays of sun hitting the tree’s canopy and working their way down and in. The reason is simple: no sun, no fruit. Branches on a fruit tree make fruit if they receive sufficient sunshine. Branches in too much shade make less fruit, then no fruit, and eventually they die. 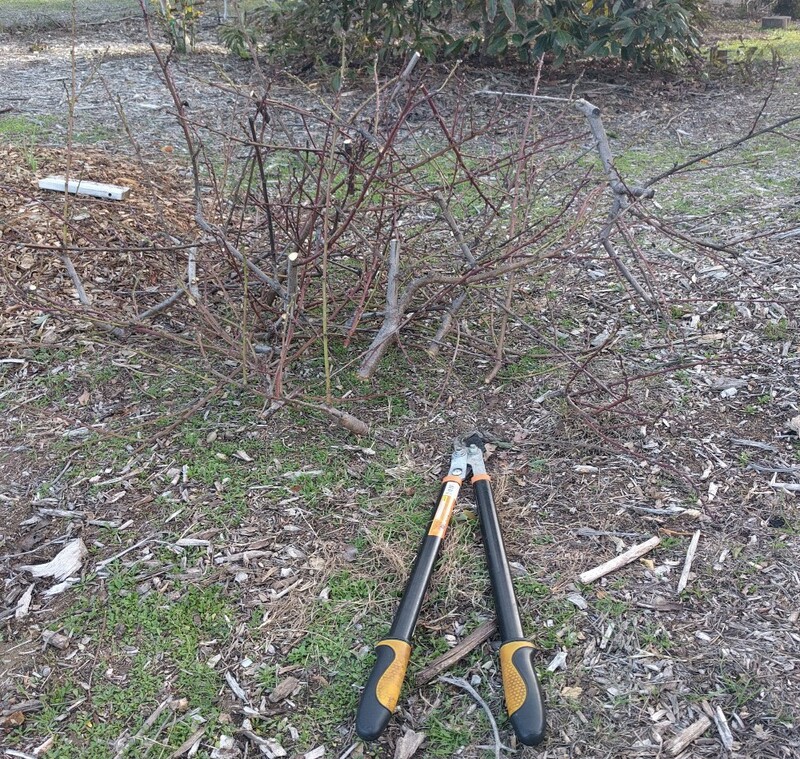 The job of pruning can feel complicated so it’s useful to have sunshine as the focus. 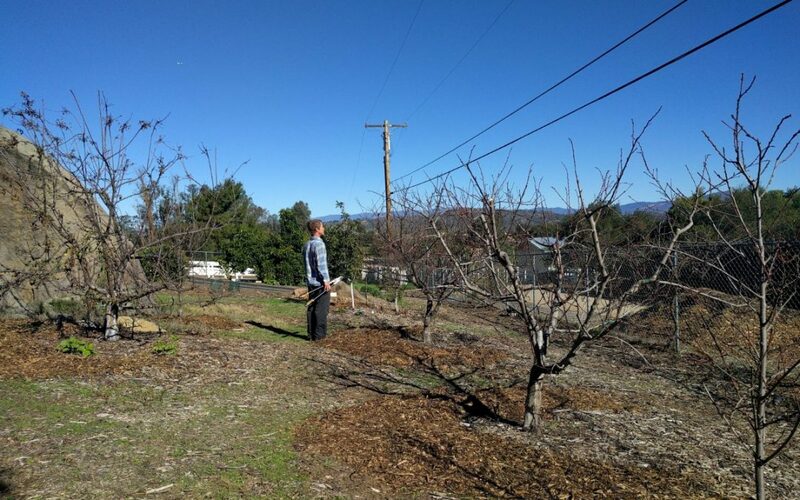 Our main job in pruning is to bring sunshine to the branches where we want our tree to make its fruit. In this post, I’ll show you how to bring the sunshine where its needed, and I’ll show some examples of when this has been done well and not so well. When I looked at this tree I saw the sun’s rays hitting the top branches and being absorbed by lots of leaves. I had to imagine the leaves, of course. Here is the tree in full leaf in June. This is what I was imagining. 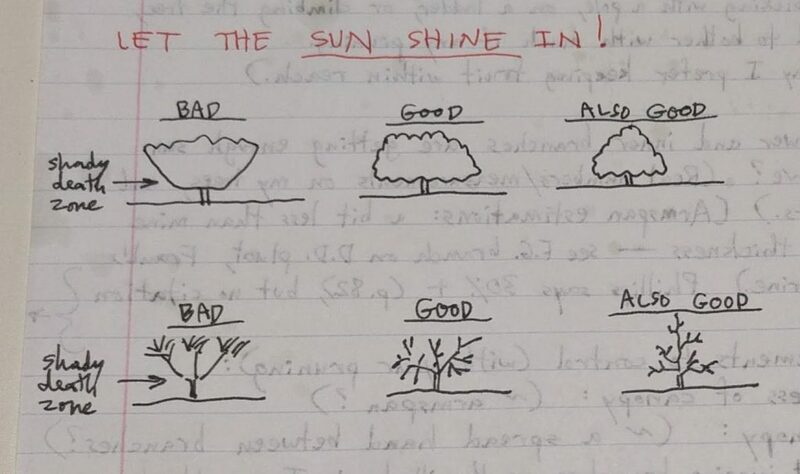 I was imagining the sunshine hitting two areas of the tree: the top and the sides. See how the branches at the top get as much sun as they could ever want, but how the bottom branches are in a bit of shade? Imagine also how much sunlight is getting into the middle of that tree. Less than on the sides, obviously. These are my two concerns: bottom branches and interior branches. Let me step back for a second to say why I care about these parts of my trees. My goal in growing a fruit tree is to get lots of fruit, all of it within reach. Therefore, I want my tree to make its fruit from the height of my reach almost down to the ground, and I don’t want any dead, wasted space in the interior of the canopy. 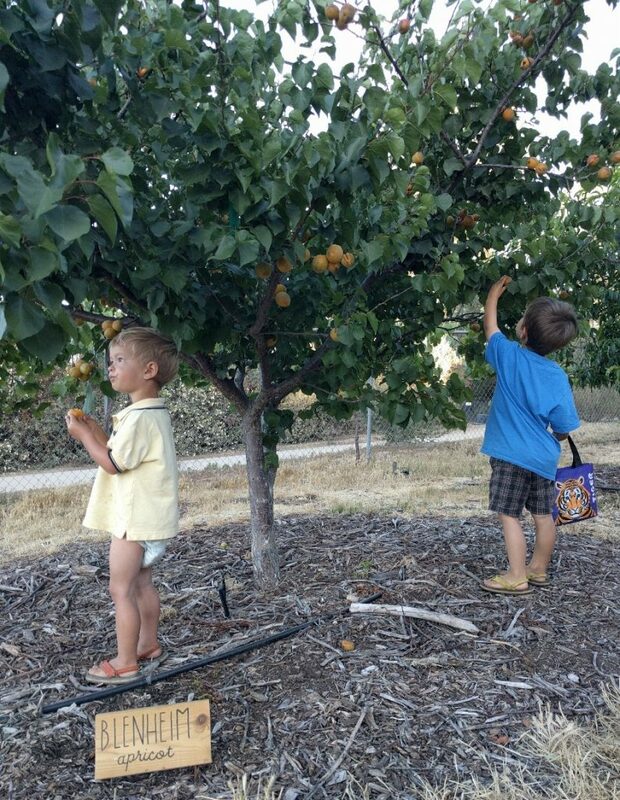 If a tree is pruned right, with sunshine in mind, then even the shortest among us will have access to all the fruit that their tiger bags or diapers can hold. So with this Snow Queen nectarine tree I pruned some branches out of the top so enough sunshine would get to the bottom branches, and I also cut out some branches on the sides. Look at how this side of the tree was wider at the top compared to the bottom. Not good. The top should be narrower than the bottom. The tree cannot have the shape of a martini glass or else those lower branches are in too much shade and they decline. And now the tree looks like this and is about finished. I’ll still shorten a couple of those smaller branches on top later. What if I hadn’t cut out those upper branches? 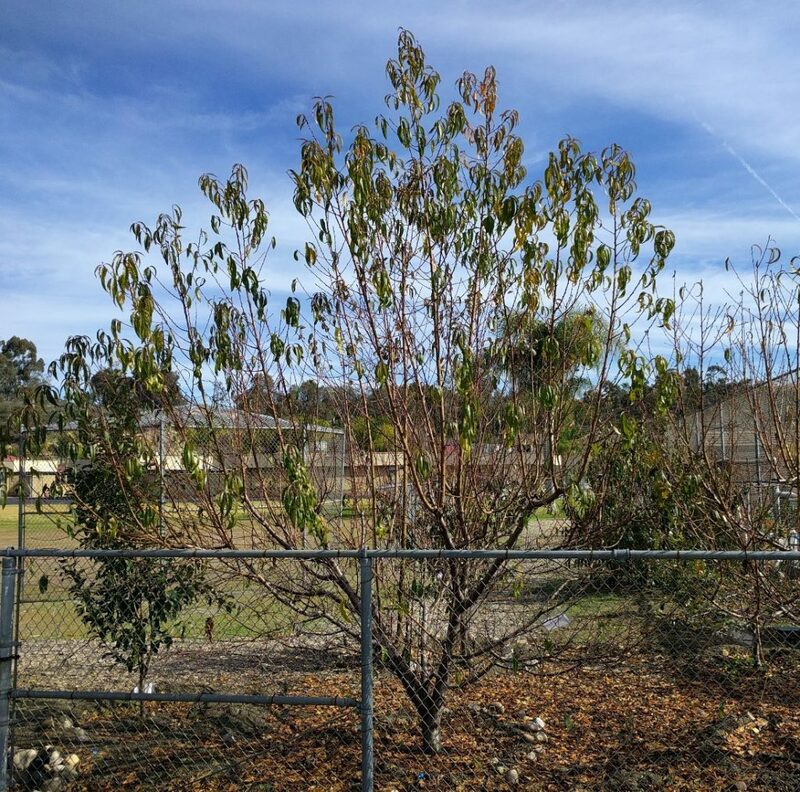 Look at this nectarine tree that I saw in a school garden. This photo was taken in January. Unless the top of that tree is cut way back in the next month or so, it will make most of its fruit out of reach this summer. If it’s not pruned to allow sunshine to the lower branches for one more year, it will make almost all its fruit out of reach for next summer. The fruit will be located higher and higher every year, and the lower and interior branches will become less and less fruitful every year, eventually dying off because of the lack of sunlight. You see this happen to fruit trees everywhere. The tree makes its fruit where the sun shines, and that is at the top and sunny sides of the canopy — wherever the top and sunny sides are allowed to be. 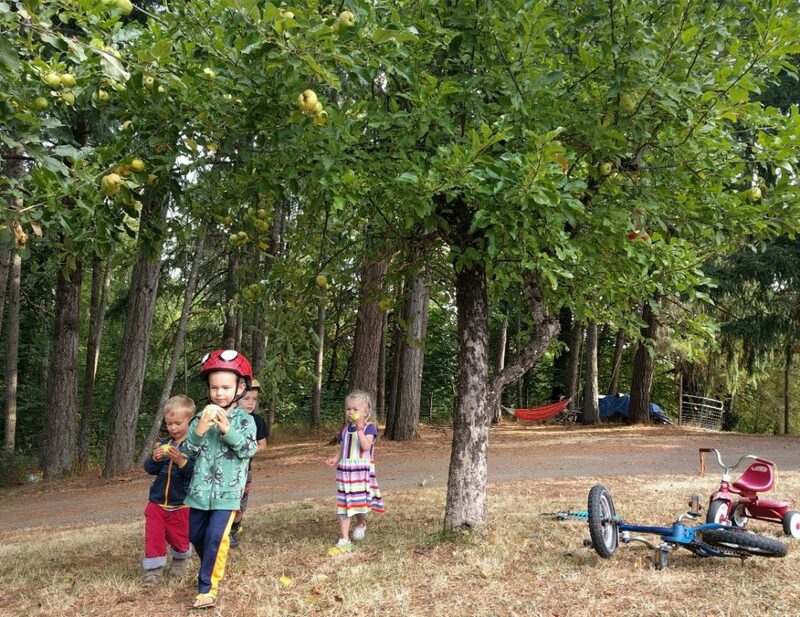 This apple tree at a friend’s house in Oregon is twenty feet tall and bears most of its fruit out of reach. I had to pick the apples from this tree for the kids. 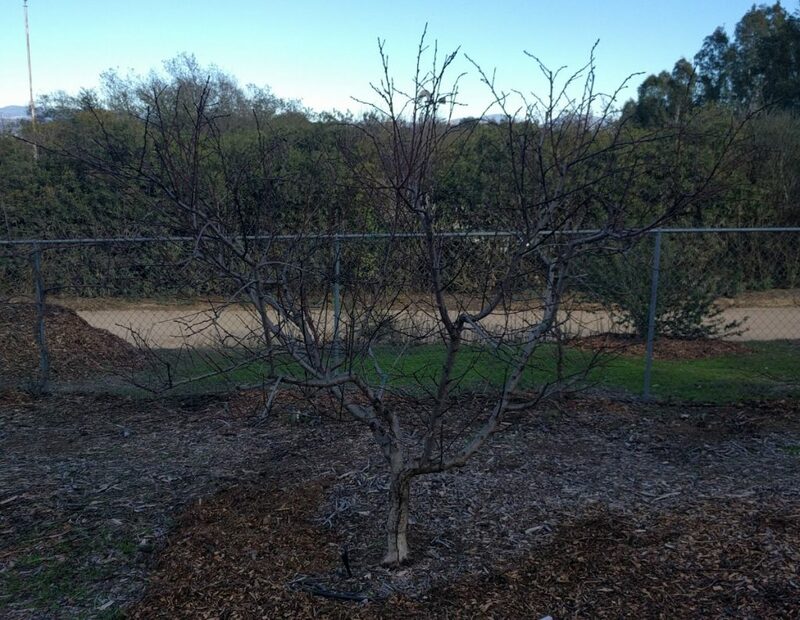 Next to my mature Snow Queen nectarine tree is a young SpiceZee nectaplum tree. It has been in the ground for only two years. In contrast to the nectarine, this SpiceZee nectaplum is not only younger but also trained in a different tree shape. 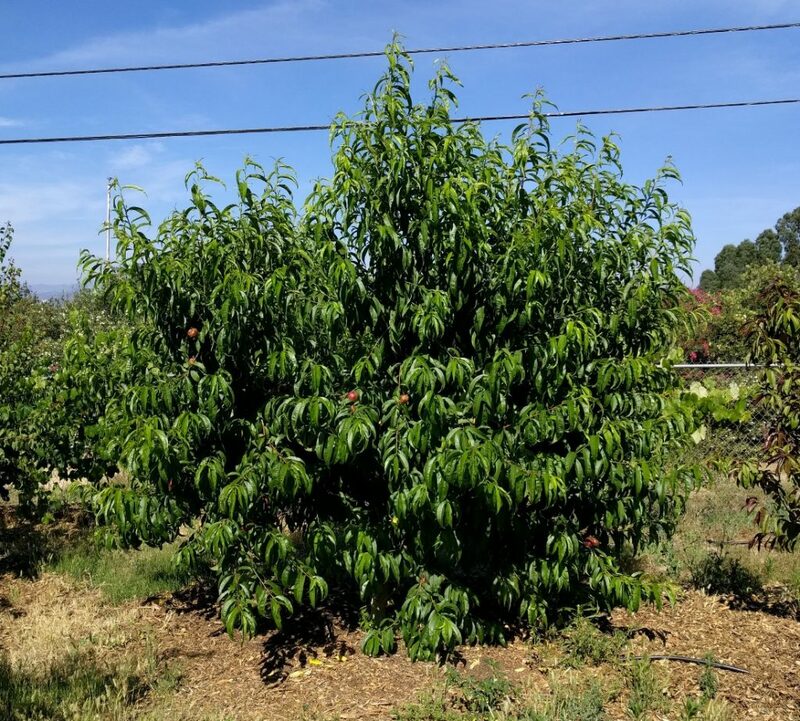 Whereas the nectarine has a globe or dome shape, called “open center” in the jargon, I have shaped this SpiceZee nectaplum tree as a pyramid, called “central leader” in the jargon. Young SpiceZee nectaplum tree on right. Despite the difference in training style, my thoughts when approaching the tree for pruning are the same: how are the sun’s rays working their way through the branches? And here’s what I notice: The top is a little too thick and wide. But wow! That’s it. This tree needs almost no pruning. I’ve found this to be the case more often with a central leader tree than an open center tree. Trees trained with a single, dominant, central trunk, and side branches that form the pyramid shape tend to be calmer and need less pruning. No need for loppers here. Just a handful of small branches thinned and headed was enough. All finished. Plenty of sun will now shine throughout the canopy, from top to bottom, side to side. Before I leave you, do be aware that your pruning can bring too much sun onto a branch. I’ve done this myself. It usually happens to open center trees or any tree that has a branch that is very horizontal. Branches that are most vulnerable are those facing south or west — not growing toward the south or west, but with their bark exposed to the south or west. 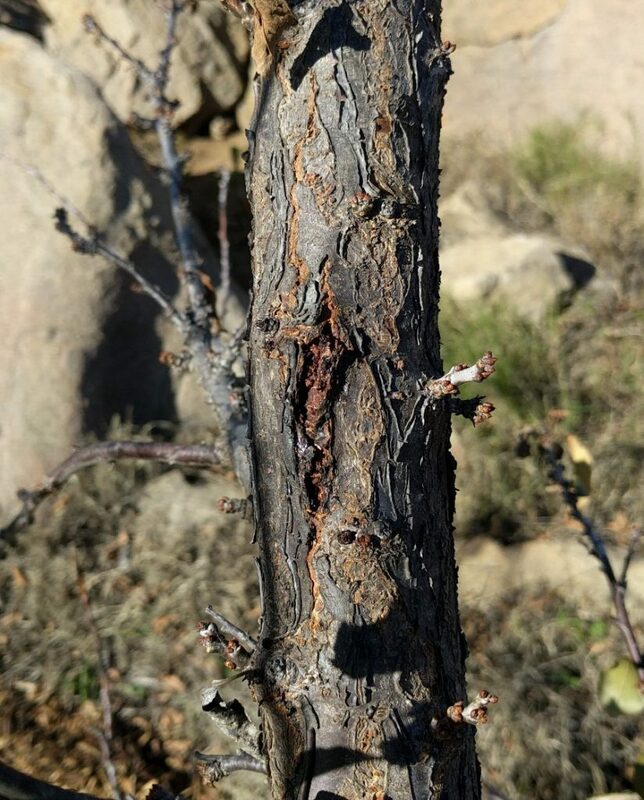 For example, here is some light sunburn on a branch on a pluot tree that is facing south. Make sure to keep branches that will shade these vulnerable branches somewhat. Otherwise, paint them with white latex paint as a sunscreen. 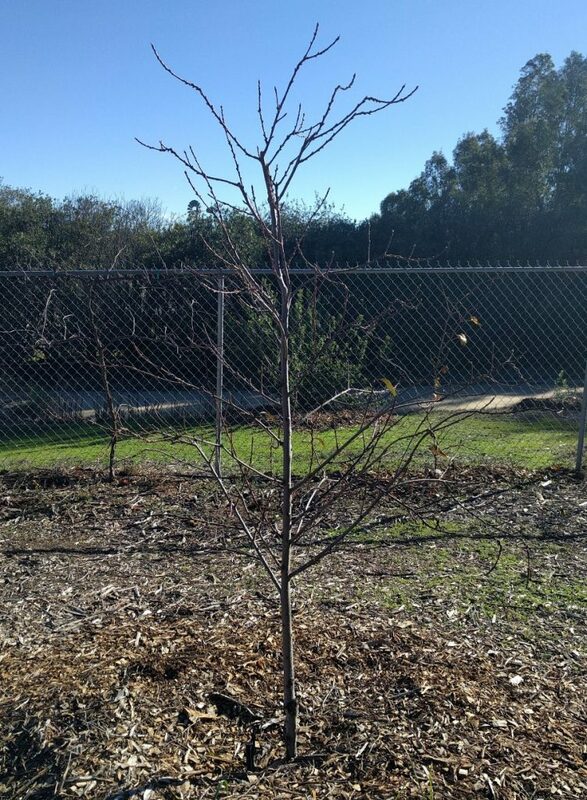 Should you prune a bare-root fruit tree? Hi Greg, Just finished pruning my trees too. 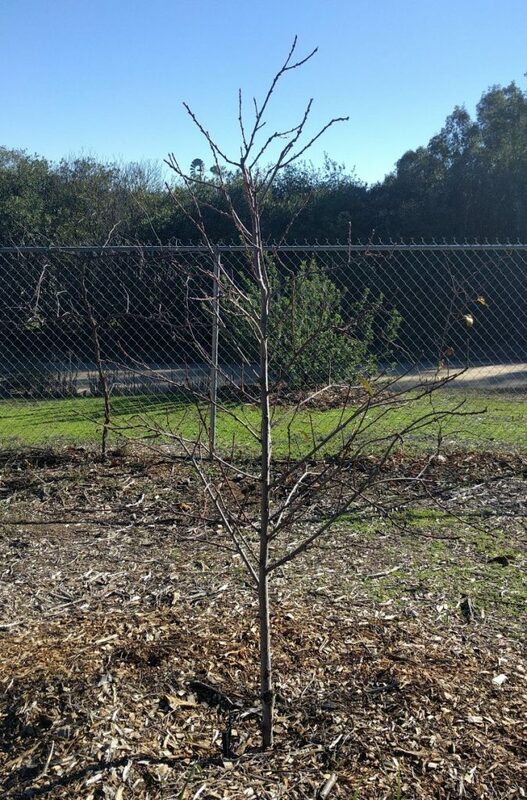 My in-law has a place in Washington where apple trees are tall and start branching high to keep fruit away from deer. 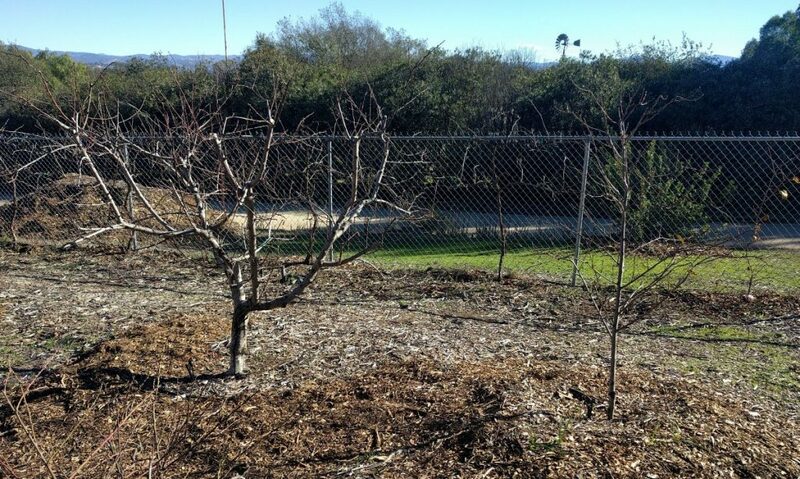 I’ve worked to keep my fruit trees at kid level too… a great way to share. Hi Greg, my question is unrelated to the post but want to ask you about poor drainage soil. I have a couple mandevillas that I grew as vine. It started to have problem late summer, early fall when leaves started to yellow and falling rapidly and killed off one of the three main branches. I bring a sample to armstrong to ask for help. He said it is due to overwatering. I told him at the top soil is dry not moist at all. He said that at the top, it drained but when the water down further doesn’t drain as well and that’s why the root rot. What can I do to improve the soil drainage at the bottom? Appreciate any suggestion. 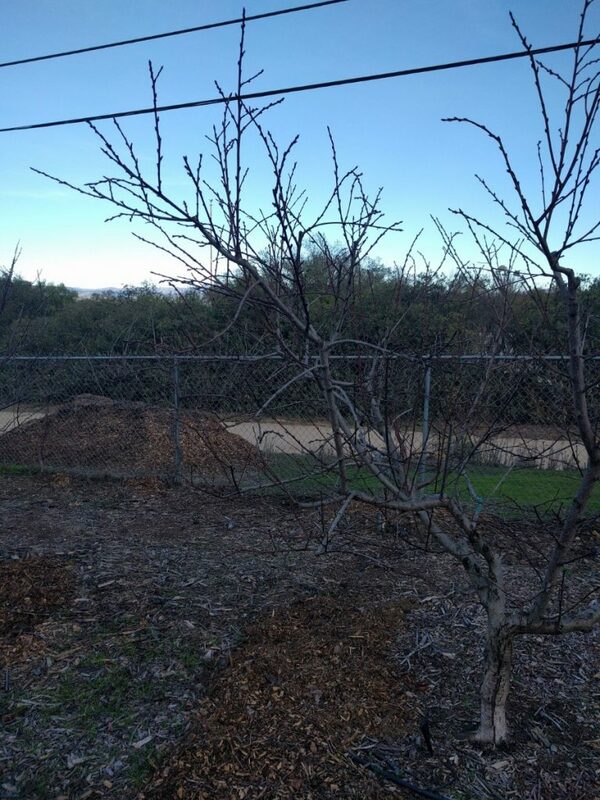 Love your page and planning to start growing fruit tree in my back yard. I asked this on your FB page as well .. Sorry for the double post. It’s usually hard to truly improve the drainage of a particular soil. However, you help your plants out in a couple ways. One way is by creating a mound to plant in. You can even use the soil in your yard or buy some top soil that is lighter in texture. This gives the plants an area of soil that will not remain soggy like the poorly drained soil below. Another way to help is by watering infrequently. Trust that the soil below the surface is remaining moist for much longer than the soil you can see on top, and trust that your plant’s roots are exploiting that moisture down below. Only give them more water once they show clear signs of thirst (cupped or wilting leaves, for example) or once you’ve dug down to feel the soil below. Watering deeply and infrequently can work for many (though not all) plants where drainage is poor.